The recent scandals regarding misinformation, privacy, and other questionable data practices have not much affected the use of social media among Americans, revealed a recent Pew Research report. The number of adult users from America on various platforms like LinkedIn, Facebook, Twitter, and Pinterest has been almost the same since 2016, according to the report. The survey revealed that almost 69% of the US adults are still Facebook users (despite trust issues), 28% use Pinterest and Twitter has 22% US adult users. Whereas Instagram users have increased in the last few years, from 32% to 37%. In 2018 and 2019, YouTube has been the most popular among all other social media platforms, with 73% users from America. While, Snapchat this year preferred by 24% users, WhatsApp with 20% and Reddit is visited by 11% of them. Pew conducted other surveys as well according to which Americans were concerned about their data security, censorship issues and spread of fake news. 6 out of 10 people were of the view that they would prefer to be more secure online. Around 72% think that political views are censored by the giant tech firms if they disagree with it. 59% said they can leave these sites anytime without much hassle. Monica Anderson, a senior researcher and co-author of the report said that people say that they are concerned about their privacy online but very few of them have actually done anything to make themselves more secure. This is the case with whatever news regarding such issues appears. Though the the number of users has not reduced, inactivity or slowdown in the use have been noticed to some extent in the last decade. As per Anderson, this trend cannot be linked to any other past incident particularly, but there has not been much progress either in tech adoption overall, be it in terms of smartphones, tablets or computer ownership. The growth has been stagnant over the past few years after active progress in tech adaptation. 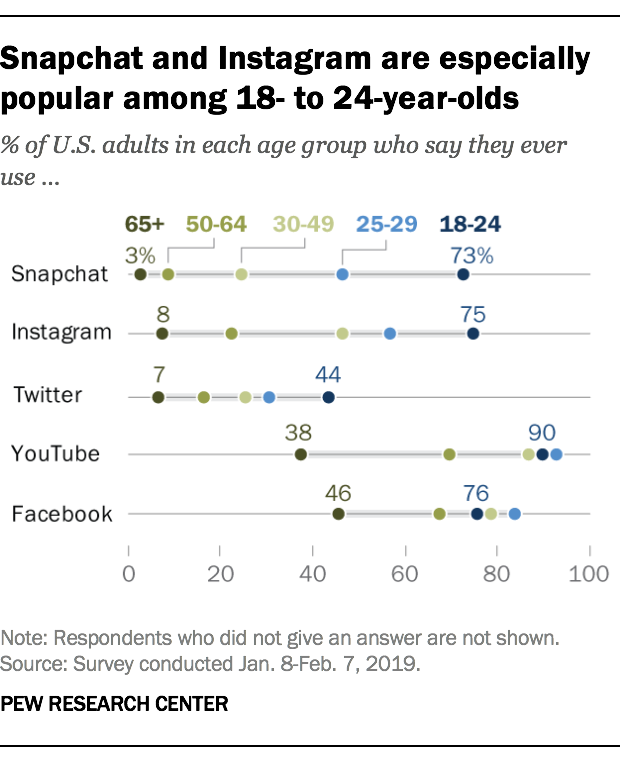 When it comes to age demographics, Snapchat and Instagram users are mostly young, Snapchat being more popular among 18 to 24-year-olds. Whereas it is used by 24 to 29 years old as well but with a little less popularity. On the other hand, Instagram is equally popular among people under the age of 30, while the distribution is stronger from 30 to 49 years old. 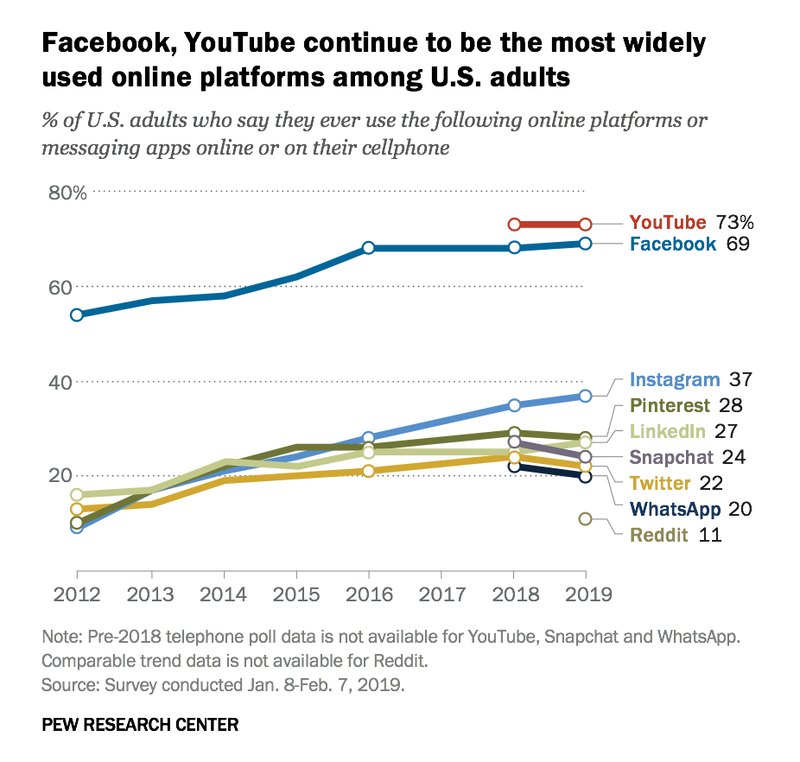 In contrast to this, Facebook and YouTube are popular among all age groups with a strong majority, but a little common among people over the age of 65. Still, 46% of people older than 65 use Facebook and 38% of them are YouTube users. Another survey found that many of the users have claimed that they are now spending less time on these platforms still the majority of the Facebook, Snapchat and Instagram users visit these sites on a regular basis.